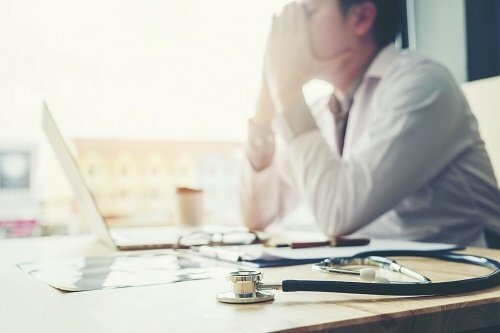 Knowing that physician burnout has increased significantly, locumstory.com recently conducted a survey of more than 3,700 physicians across specialties, work settings, and U.S. regions to better understand physicians’ perspectives about their professions. Among the findings: 52% of surveyed physicians reported feeling burned out. 74% of physicians reported frequently seeing symptoms of burnout in other physicians. As compared to the same study conducted in 2016, physicians in 2018 feel less overworked than two years ago. Yet, burnout, depression, and other issues still cause significant issues for more than half of physicians. 55% of physicians have less free time outside of work than when they first started their career. 56% of physicians feel overworked. More than half of physicians have considered leaving the profession early due to workload. 46% of physicians said they were spending less time with patients than they used to. 53% of physicians considered leaving their profession within the past few years. 52% of physicians say that burnout has affected their job performance. 69% said they spend too much time dealing with bureaucracy and administrative paperwork. 69% said they feel overworked and stressed. 64% said they spend too much time entering data into electronic health records (EHRs). 55% said they are unable to spend enough time with family. Common burnout symptoms include irritability, apathy, anxiety, anger, insomnia, increased illness, and loss of appetite. Another sign, which 54% of physicians who self-report burnout also experience, is chronic fatigue. Nearly half of physicians who report burnout also complain of impaired memory and attention. 37% of those who felt burnout also reported depression, and suicidal ideation (according to the survey, 6% have contemplated suicide because of their profession). If you feel depressed, seek treatment. If you feel suicidal, call the suicide hotline at 1-800-273-8255 — and seek treatment immediately. If you have symptoms of burnout, recognize what is going on, and begin looking into possible long-term solutions, as discussed below. In addition to the direct personal costs of burnout on health, burnout affects almost all aspects of a physician’s life. Some areas include job satisfaction, relationships with coworkers, personal time, and patient care. Taking a vacation and/or spending more time with family. Turning off their phone when not at work or on call. Bringing in locum tenens physicians to help cover staff shortages and prevent burnout. We’re seeing this trend more and more among physicians who own their own practices; they’re planning for this from the get-go. Turning to locum tenens, either by taking an international assignment between jobs to refresh, or as a permanent way to take charge of their career, reduce how much time is spent on paperwork and increase time spent with patients, and to take control of their schedule, health, and career. Using locum tenens for a service mission to refocus on providing outstanding medical care where it’s most needed. “We’re seeing an uptick in numbers of doctors wanting to go on a medical mission for six months or even longer in order to give back to underserved communities, and they’re using locum tenens to do so and to reset after feeling burned out,” explains Matt Richards, Global Medical Staffing’s National Accounts Executive. Read one physician’s story. Even though physician burnout has gone down as compared to the 2016 survey, it’s alarming that more than half of physicians report feeling burned out, and that nearly three-quarters see burnout among their colleagues. Be honest with yourself if you are burned out, then put these six steps to work to help alleviate the feeling. Interested in learning more about how locum tenens can help you take charge of your career and alleviate burnout? Click the button below to browse our current openings, or give us a call at 1.800.760.3174.